My love of spooky and eerie things probably stems from one of my favorite childhood movies: The Ghost and Mr. Chicken, that starred Don Knotts as Luther, a small town newspaper reporter, who was looking for his big break. It comes in the form of an unsolved murder that took place in a haunted mansion where Luther spends an unnerving night. Would I take the same risk Luther did that night? Absolutely. If it’s scary, spooky, ghostly, or haunted, count me in! I wonder if Luther would’ve been brave enough to endure a night at our own haunted Hill View Manor, or the house on Cliff Street? Hill View Manor opened in 1926 as the Lawrence County Home for the Aged. It served as a shelter for the homeless for many years and eventually became a skilled nursing home, changing its name to Hill View Manor in 1977. Oftentimes residents would claim to have seen the ghostly image of a young boy visiting them in their room. Anyone who had seen his ghost would pass away shortly thereafter. The facility closed in 2004, but paranormal investigations revealed there were still strange occurrences around: muffled voices, objects moving, and footsteps shuffling down the hall when no one was there. I was able to walk through the building shortly after it closed permanently. All I heard was the sound of my own footsteps echoing down the now vacant corridors. All I saw was dust and cobwebs in the corners and shadows on the walls. Though there was an eerie feeling that came over me thinking of how lonely some of the former residents must have been, particularly those who were there in the early years, deserted by their families, or perhaps not having a family at all. There is also a small cemetery behind the facility where some of the residents, lacking funds for a proper burial, were laid to rest (or unrest as the case may be). Another home on Cliff Street is also reported to have been the site of strange and odd occurrences. Built in the 1800s the house has been the object of eerie apparitions; flying wisps of smoke; loud knocking on the walls, floors, and ceiling; creaking furniture; and footsteps on the stairs. One family that lived in the house reported that their young daughter regularly spoke with “someone” in the corner of an upstairs bedroom, which supposedly belonged to a small girl who had tragically burned to death in the backyard. That was only one of several deaths that occurred in the old abandoned, dilapidated house over the years. Besides haunted houses, every town has its local legends. In New Castle there are two such legends that gained their notoriety for being scary and bizarre, and the fascination with these legends never diminishes. Mary Black, who was an alleged witch during the 1800s, has intrigued many people over the years. The question in the back of everyone’s mind is: Was she a witch or not? I leave it for you to decide. 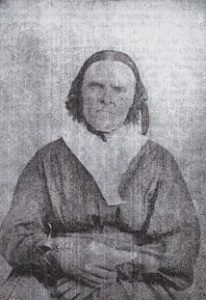 Mary Johnson Black was born in 1801 in Ireland, married Andrew Black, and immigrated to western Pennsylvania around 1832. She resided in the Shenango/Taylor Township area and had nine children. Mary died in 1888 at the age of 87. She was buried along with other family members in the Tindall Cemetery. This cemetery, situated in a wooded area of Chewton, just off Turkey Hill Road, is now neglected and overgrown. Due to vandalism, Mary’s headstone has long since been removed and currently resides safely at the Lawrence County Historical Society. It was actually not found at the cemetery, but at the bottom of the West Pittsburgh Swamp. I personally went on a quest to the swamp to try and find the exact location of her grave. After two failed attempts I was still determined to go back for a third try until she appeared to me in a dream. She arose out of a casket in a desolated area, looked me square in the eyes, and warned me not to come back. “Please, just leave me rest in peace,” she screamed. I did! I think Mary was just a misunderstood woman of her time. She had a black cat which oftentimes was associated with witches, and she also used herbs for medicinal purposes, which may have prompted the controversy. The other local legend centers on Raymond Robinson, a.k.a. The Green Man. This famed nickname came about from his skin, which cast an eerie green glow due to an electrical shock he suffered in childhood. Robinson was only nine years old (1919) when he was peering into a bird’s nest and was injured by an electrical line on the Morado Bridge, outside of Beaver Falls. The bridge carried a trolley and had electrical lines of both 1,200 and 22,000 volts. Miraculously Robinson survived, but the accident left him without his eyes and nose, with a disfigured mouth and ear, and an arm severed at the elbow. Because he was so severely disfigured he became a lifelong recluse who passed the time by listening to the radio, hiking in the woods, working with crafts, solving brain-teasing puzzles, and sometimes mowing the grass with a manual mower. He also ventured out at night to take long walks, feeling his way with a walking stick. Local tourists, who drove along this road hoping to catch a glimpse of him during his nightly walk, referred to him as The Green Man or Charlie No-Face. Robinson usually hid from the curiosity seekers, but would sometimes exchange a short conversation for a photograph, or for beer or cigarettes, though some of these would be laced with drugs by taunting teenagers. Despite the cruelty, nothing deterred him from his nightly walks until he retired to the Beaver County Geriatric Center, where he died in 1985 at the age of 74. As the legend of The Green Man is passed down from generation to generation, people are actually surprised to discover that he was an actual person who was liked by family and friends. His story has been passed down so many times that it seems the real man, Raymond Robinson, has been overshadowed by the image as The Green Man. Although I was too young to ever have gone in search of this urban legend, I most surely would not have thought him scary, but a truly remarkable man. The last ghost story I would like to mention is the former Elks building that was located downtown on North Mill Street. Built in 1887, it was one of the earliest Elks Lodges in the country. By 1915, the Elks had outgrown their building and in 1916 a new one was built that was one of the most prominent in town. Elks Lodge members were primarily from vaudeville and theatrical groups, which may explain the theatrical character of the oval room on the third floor. 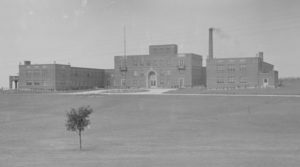 The new building also had a large meeting/dance hall on the top floor, a billiards parlor, social rooms, a two-lane bowling alley, a kitchen and dining area, locker rooms and shower facilities, as well as separate reading and writing rooms. By the 1980s, membership dwindled, and the remaining Elks decided to relocate to a smaller building. 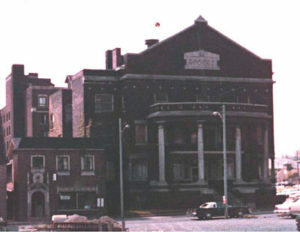 In the 1990s, ownership of the old building was given to the city, which allowed the building to deteriorate with no efforts made to restore or reuse it. By 2011, the city decided to demolish the building despite the Pennsylvania Museum and Historical Commission’s interest in potential rehabilitation. Before the building was demolished, a group of paranormal investigators from California organized a group of volunteers, of which I was one, and conducted a ghost tour through the facility. We each had to sign a waiver, and as we walked through the building I started to think I might have been too hasty in my decision to join this group. The tour began in the scorched theater-like room on the first floor. A damp, musty odor permeated the air, and ashy debris from a prior fire was scattered in every corner of the rooms. Floors boards were rotting away, and we had to tread across them very carefully. The main ghost who supposedly haunted the Elks Lodge is named Leon. Though several attempts were made to contact his spirit that night, Leon gave no indication he was there. I think the “real” ghosts that haunted the lodge were those of past memories – happier times when bands played lively tunes, people laughed and drank at the bar and engaged in the latest gossip and news about town. I closed my eyes and imagined myself floating across the dance floor, laughing, gossiping, and enjoying the moment, perhaps with a gentleman named Leon. So, real or imagined, evil or harmless, the ghosts of Lawrence County continue to haunt our memories, and will forever link us to our past. I think Luther would have loved living here!! I know I do!